Can you believe it's August already! I sure can't! Today is the first day of the new Holiday Catalog! If you haven't seen it yet, you can see it HERE. You can also go to the Holiday Catalog section of MY ONLINE STORE to place an order! There are two wonderful new dies that are now available, too! Stampin' Up! now has new Thinlit Card Dies! It's an easy way to make a flip flop card! Watch the video below to see how easy these dies are to use! If you want to get your hands on these great dies (I sure do! ), you can place your order at MY ONLINE STORE. I've also got the first Craft Project Central project for August to share with you. Where has the summer gone?! This cute project was designed by Julie Beltramo. 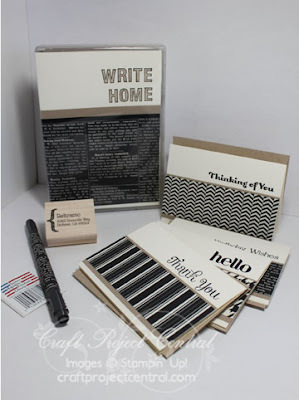 Make sure to check out her great blog, Just Julie B's Stampin' Space. If you would like to learn how to make this project, you'll want to subscribe for the month of August. With your subscription, you'll get illustrated, step-by-step instructions for 10 wonderful projects for only $10! You can find out how to gain access to a bonus eleventh project over at Craft Project Central.